This southern Africa safari tour takes you through some of the best of South Africa, Namibia and Botswana. From the vineyards of the Cape, across 2 deserts and to the spectacular landscapes and wildlife of Namibia and Botswana, this is an adventure that will not be forgotten. Prepare for your international flight directly to Cape Town or via Johannesburg (South Africa). Arrive at Cape Town international airport and meet your English speaking guide. You will be transferred to your hotel. Your afternoon is free to rest or explore the town yourself. Dinner will be at a restaurant in town or at the hotel. We stay in the Protea Hotel at the Cape Town Waterfront. Today you will enjoy a full day town tour of Cape Town. You will visit Simon's Town, the Cape of Good Hope and enjoy some wine tasting on the wine route. Cape Town is a coastal city in South Africa. It ranks third among the most populous urban areas in South Africa, after Johannesburg and Durban. It is also the provincial capital of the Western Cape. As the seat of the National Parliament it is the legislative capital of the country. The city is famous for its harbour, for its natural setting in the Cape Floristic Region, as well as for such well-known landmarks as Table Mountain and Cape Point. It is one of the most multicultural cities in the world. In 2014, Cape Town was named the best place in the world to visit by both the American New York Times and the British Daily Telegraph. Located on the shore of Table Bay, Cape Town was first developed by the Dutch East India Company as a supply station for Dutch ships sailing to East Africa, India, and the Far East. Jan van Riebeeck's arrival on 6 April 1652 established the first permanent European settlement in South Africa. Cape Town quickly outgrew its original purpose, becoming the economic and cultural hub of the Cape Colony. Lunch will be enjoyed at a restaurant and dinner at the hotel. After breakfast at the Hotel, we depart for the northern Cape, passing scenic vineyards along the way. Lunch will be on the road. We arrive at our campsite at Springbok in the afternoon. At the right time of year (August to September), the countryside is covered in a stunning blanket of wildflowers. If time permits, we will visit this beautiful spectacle. Dinner will be had at the lodge. After breakfast, we travel eastwards, enjoying a picnic lunch en route. We arrive and check into our lodge and visit the Augrabies Waterfalls. When in full flood, the falls provide an awesome sight as the Orange River thunders down the 56m gorge. Dinner will be enjoyed at the lodge. After breakfast we continue our journey towards the Kgalagadi Transfrontier Park with a quick stopover in Upington. Lunch will be had en route. The Kgalagadi Transfrontier Park is located in the beautiful Kalahari desert, spanning parts of both Botswana and South Africa. It offers a wide range of wildlife in a majestic setting of low red dunes and unique flora for a unique safari experience. 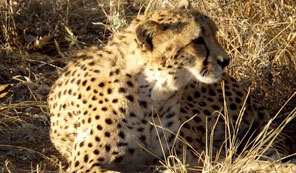 Wildlife includes herds of wildebeest, gemsbok, springbok and eland and predators including lion, cheetah and leopard. The park is well known for its birds of prey including Martial Eagles, Bateleurs, Tawny Eagles, Lanner Falcons, Secretary Birds, Owls and Vultures. After breakfast we will embark on a full day of safari, looking out for the many animals which roam this striking, but harsh environment. For lunch we will have a picnic or eat at the lodge. After breakfast we head west into Namibia and on to the Fish River Canyon. We have lunch en route before arriving at this spectacular natural phenomenon which hides out of sight on the flat dry plateau until you are almost upon it. The canyon is believed to be the second largest in the world, after the Grand Canyon. Its enormous gorge meanders along for a distance of about 160 kilometres. It is up to 550m deep in parts and up to 27km wide. If time permits, we will visit the lookout before we continue to our lodge. We then set off on our journey to Sossusvlei, stopping to have breakfast in the dunes. We will visit the much photographed Dune 45, a stunning star dune which stands over 170 metres. Sossusvlei itself is a large, white, salt and clay pan located in the midst of this ancient, red wilderness and provides wonderful photographic opportunities. Occasionally the pan fills up with water offering a fantastic spectacle as the glassy lake reflects the surrounding dunes. Nearby is Deadvlei, another dry pan which is characterised by the ghostly skeletons of scorched dead trees, some as old as 1000 years, standing scattered across the white expanse. This eerie scene of stark contrasts, makes for stunning photographs. We watch the sunset from Elim Dune before returning to the lodge. Today we depart for Swakopmund, one of Namibia's charismatic coastal towns. We stop over at Solitaire, famous for its German cake apple tart. We continue our journey, passing by the Gaub pass and Kuiseb river, where two Germans once hid, trying to escape the South Africans. We arrive in Swakopmund and settle into our accommodation. Swakopmund is a typical German town with its historic buildings built in the years 1884 to 1915. We visit the petrified forest before driving through the spectacular Damaraland landscapes towards the Etosha National Park, passing through Khorixas (khori means mustard tree), former capital of the Kunene region. The Etosha National Park spans an area of 22 270 square km, and is one of southern Africa's most important game reserves. A large part of the area is taken up by a vast salt pan. This beautiful barren and often haunting landscape is surprisingly abundant in game, which often congregate around the various waterholes scattered around the park, allowing for some spectacular safari game viewing. The park is home to hundreds of species of mammals, birds and reptiles, including several threatened and endangered species such as the black rhinocerous. 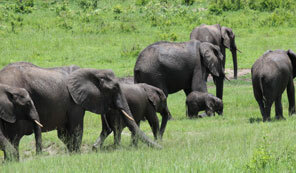 Visitors can expect to see many buck species, elephants, giraffe, rhino and lions. If you are lucky you will see leopard and cheetah. After good rains, the salt pan fills with water attracting a mass of flamingos. More than 340 bird species have been counted in the park. We spend the night in tents at the Okaukuejo campsite inside the park. We have breakfast and depart early (the best time for seeing animals) for another safari game drive in the eastern side of the park. We depart the park in the direction of Grootfontein where we will stop for lunch before continuing our journey to Rundu. After breakfast, we embark on a safari game drive in the Mahangu National Park. This small game reserve is abundant in wildlife and offers great opportunities to see four of the big Five – Elephants, Buffalo, Lion and Leopard. More than 300 bird species are found here. Look out for the very large Baobab Trees which are numerous in the park. 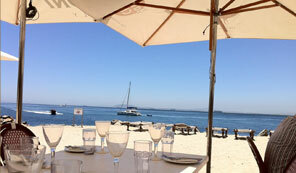 We travel in the direction of Kongola and will have lunch at Mazambala Island Lodge or similar. We will enjoy dinner and overnight here. Breakfast will be enjoyed at the lodge before departing towards the Caprivi region via Katima Mulilo and crossing into Botswana to Kasane. Lunch will be had en route. We arrive at the Victoria Falls and check in at the Rainbow Hotel. We will enjoy a sundowner boat cruise on the Zambezi river, before having dinner at the hotel. In the morning, we visit the spectacular Victoria Falls, considered the largest in the world. The thundering waters can be heard from 40 km away while the spray and mist rise to a height of over 400 metres. In the afternoon, you are free to do some optional activities, such as a helicopter ride. You will be transferred to the Victoria Falls Airport for your connecting flight. End of service. We trust you enjoyed your African Safari and Tour with Omuhimba Safaris!